City National Bank is a minority owned and managed bank that plays a pivotal role in strengthening urban communities. We are a forward-thinking financial institution that provides strong, trustworthy partnerships to individuals and businesses. Our mission is to build economic strength and improve the quality of life within the communities we serve. We succeed by providing the highest quality financial services, including innovative personal accounts like REWARDS Checking and low-cost business loans. Our community commitment runs deep in everything we do, including our creation of the City National Urban Fund to support economic development projects. Come join our mission. You receive the pinnacle in financial products and service, while gaining peace of mind your deposits are re-invested in the urban communities of New Jersey and New York. 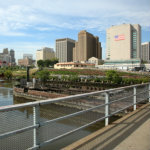 City National Bank started in 1971 when a group of African-American community leaders recognized a tremendous economic void in Newark, the largest urban center in New Jersey. They believed Newark needed a financial institution that would be sensitive to the financial needs of minority residents whose access to credit and banking services was historically limited. Charles L. Whigham, a prominent local businessman, spearheaded a grassroots effort to raise capital. Walking door-to-door, the founders met with church groups, individuals and various organizations to sell stock in the bank. In less than two years, $1.2 million was raised when nearly 1,800 shareholders purchased 60,000 shares. In 1973, City National Bank of New Jersey was established as a full-service commercial bank. In the following decades, City National Bank's mission grew, expanding beyond the Newark roots to include Harlem and Brooklyn. Even as the bank continued to meet growth objectives, City National Bank maintained a steadfast commitment to better serve the needs of families, non-profit organizations, faith-based institutions, and businesses with the various service communities. Part of the consistency and forward progress can be attributed to leadership stability. In 40 years, City National Bank has had only three president/CEOs: Charles L. Whigham (1973-1989), Louis E. Prezeau (1989-2011), and Preston D. Pinkett III, who today leads City National Bank to a new era in true community banking.